One of the best things about having pets is that they love you unconditionally, even when you haven’t done anything all day except binge watch “Mad Men” on Netflix. The thing is, just like people, pets get bored. To make matters worse, they don’t have thumbs and can’t play Candy Crush like you can. And while you might find “Keeping up with the Kardashians” endlessly entertaining, they don’t care how many Easter baskets North West received this year. As responsible pet parents, we need to give our pets ways to exercise their brains as well as their bodies. One way you can do this is by providing entertaining dog toys. 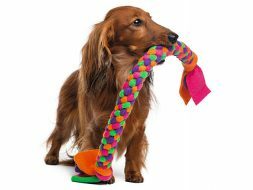 The problem with dog toys, however, is that they can sometimes become costly, and if they are not well-suited to your pet, they may not last as long as you’d like. We’ve all been there: You pick up the most adorable stuffed alien, only to find it ripped to shreds a few hours later—or in the case of my pit mix, within minutes. For those minding their budgets, this just isn’t a cost-effective strategy. A Water Bottle Wrapped in a T-shirt: This one means sacrificing a T-shirt, of course, but it’s just about as easy as it gets. Simply take an empty plastic water bottle, place an old T-shirt around it, and secure it by knotting the ends. It’s the DIY version of a squeaky toy! A Knotted Towel: Have an old towel on hand that you’re not using anymore? Tie it in a knot. That’s it. Consider this option the equivalent to those fancy rope toys. An Old Pair of Jeans: When your oldest pair of jeans rips in the wrong place, as they inevitably do, you have options. You could throw them away, or you could turn them into another DIY dog toy. Cut them into strips, braid and tie together in a knot at the ends. The best thing about this DIY dog toy is that it’s a little more durable than some of the other options. A Food Dispensing Toy: Nothing is more exciting for most dogs than a toy filled with treats, but these are sometimes among the most expensive toys to purchase. To get similar results at home (for none of the price), take an empty plastic container with a lid (like a butter container) and wash it out thoroughly. Poke a few kibble or treat-sized holes in the container, add a few treats or pieces of food and replace the lid. This can occupy your dog for a solid amount of time, as the treats will take some effort to get out. Always make sure your dog is well-supervised when playing with toys and be sure to examine them carefully for damage. Once any toy starts to come apart, be sure to throw it away immediately.